Picture shamefully stolen from Sciencebhakta, a blog at Good Shepherd Catholic School. This, ladies and gentlemen, is how a spiritual iceberg should look! One of the obvious things is to not put all your goods in the shop window. That is to say, if you talk about spiritual things, you should know a lot more than you say. Okawa recommends being like an iceberg, with only a small part of your revelations visible to people, and the rest below the surface. 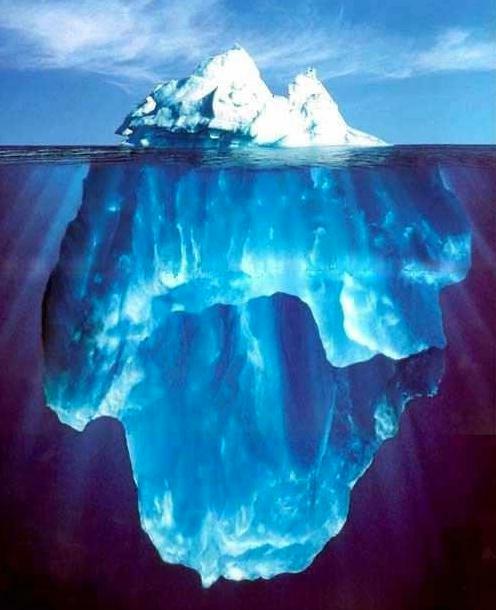 For actual physical icebergs, the proportion that is above water is about 1/8. So for every revelation you share with others, you should have seven more revelations of the same sort. I wasn’t there, obviously, but according to Okawa he was getting spiritual messages from various high spirits from Heaven for years before he started his organization. But having seen what happened to other religious leaders, he was quite wary of telling everyone until he understood everything clearly. I have to agree there. I don’t want to mention names, but there are a number of people in the New Age movement at least that strike me as “one trick ponies”. They have one big revelation and they are going all out with it, but not all people are the same. So we get various specialists and people who follow them. You see the same in Protestantism. Perhaps it is something in the culture of northern Europe, but we seem to have a lot of small churches that break out from some other church because they get some revelation that the others don’t have. Each of them is convinced that their revelation is a matter of life and death. Often these revelations are purely theological, that is to say, you cannot actually see that these people become better by believing in this or that particular detail of doctrine. They don’t become happier, more helpful and more merciful. Of course it could still be an important piece of doctrine, but how will you prove it when you don’t have “fruits”? Okawa is not the first to bring out that idea, of course. Jesus seems to have pretty much shut up about spiritual things from he was 12 till he was 30. He is later quoted as saying that a teacher who is trained for the Kingdom of Heaven is comparable to a host who brings out old and new things from his storage. That is the same thing, is it not? To have a storage of good stuff before you start hosting a large party. So I’ve been thinking a bit about how I measure up in that regard. But then again I don’t really think of myself as a religious teacher. It is a dangerous job. It is bad enough to destroy your own life, but destroying others surely is worse. I should write about games, or snow or something, I guess. But this stuff is also interesting. I wonder if the other people who buy his books have the same experience. That seems unlikely, there is supposedly sold millions of them by now and the world is pretty much the same, isn’t it? So much so that I had never head about Happy Science until I accidentally came across one of their movies. But perhaps most of the readers are just busy storing their revelations beneath the surface. This entry was posted in religion and tagged Happy Science by itlandm. Bookmark the permalink.